Thailand's military coup condemned Jump to media player The US has led widespread international criticism of a military takeover in Thailand. Martial law declared in Thailand Jump to media player The Thai army says that it is imposing martial law amid a political crisis "to preserve law and order". Thailand braced for further turmoil Jump to media player Thailand could be set for more political turmoil, with supporters and opponents of ousted Prime Minister, Yingluck Shinawatra, both planning demonstrations in the coming days. Thailand's democracy in limbo Jump to media player Thailand has been ruled by the military since the coup and the country may not return to democracy for another 18 months. 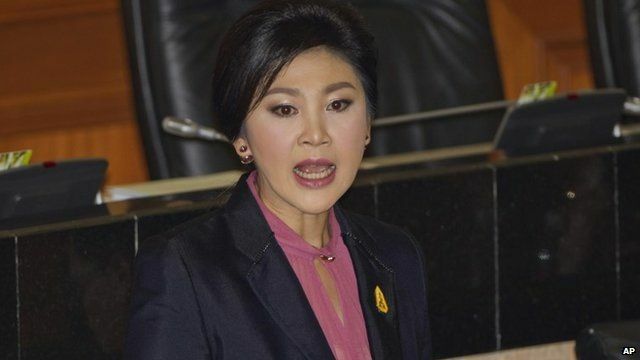 Thai parliament elects Yingluck Jump to media player Thai lawmakers have voted in the country's first female prime minister, 44-year-old Yingluck Shinawatra. The former prime minister of Thailand is making a rare public appearance at the National Assembly in Bangkok to contest impeachment proceedings against her. Yingluck Shinawatra, whose government was ousted by a coup last May, is facing accusations over the controversial subsidy to rice farmers she introduced while in office. Jonathan Head reports from the parliament building in Bangkok.